On a rather soggy weekend at Wartime in the Vale (June), Mother Nature slapped me round the face with the back of her gale-force hand and tested my hairspray and heels to the limit with rain. It then struck me how different and more prepared you have to be as an entertainer at WWII and other open air events. Walking around as a visitor, you bask in the glory of vintage vehicles, reenactors, stalls and entertainers, but forget that those singers, dancers and models that enthrall their audiences aren’t effortlessly immaculate. They have to walk the same cobbled streets you walk, brace the same weather and still have to look as if they stepped out of a magazine or movie, no matter how boggy the fields. I always love watching such performers as Lola Lamour, who (like me) is a complete devil for iconic 1940’s fashions, but to abandon her original snakeskin heels for a pair of wellies would degrade her star-like status and outfit. So we must hop, wobble, hobble and skip to dodge the hazards that may turn our nylons into “Goodbye, so long!”s and beloved pinup shoes from ‘irreplaceable’ to ‘untraceable’ under the mud. I stare enviously at those wearing military gear and warm boots, but am hell bent in wearing my lovely hats and 40’s dresses! Sure I could shelter in a tent for the entire event, but what would the fun in that be? I want to be out, meeting people, seeing things and buying bargains! Portaloo’s can also be a strategical nightmare as you force your layered outfit into the confined space, dodge the floor of mass disruption (the glory of mud caught in the deep tread of boots), try and balance your handbag as you struggle with your straight-jacket underwear and test the endurance of the wall and door with many an accidental elbow ‘thwack’ as you try and rearrange your outfit again. You either exit looking as if you have been wrestling hippos in there or with an upturned nose and shudder. Classic signs of a girdle struggle is when you can hear the lady in question jumping up and down in the cubicle and she comes out all red faced and puffed out. I almost feel like waving a little flag and giving a cheer to those poor souls that survive the porta-hoopla. My most recent event was a huge challenge because of the weather! Getting changed in a nice large mess hut was great, but then negotiating the journey back to the performance tent (where I would have to wait outside to make my entrance) in the mud and rain was a different story. 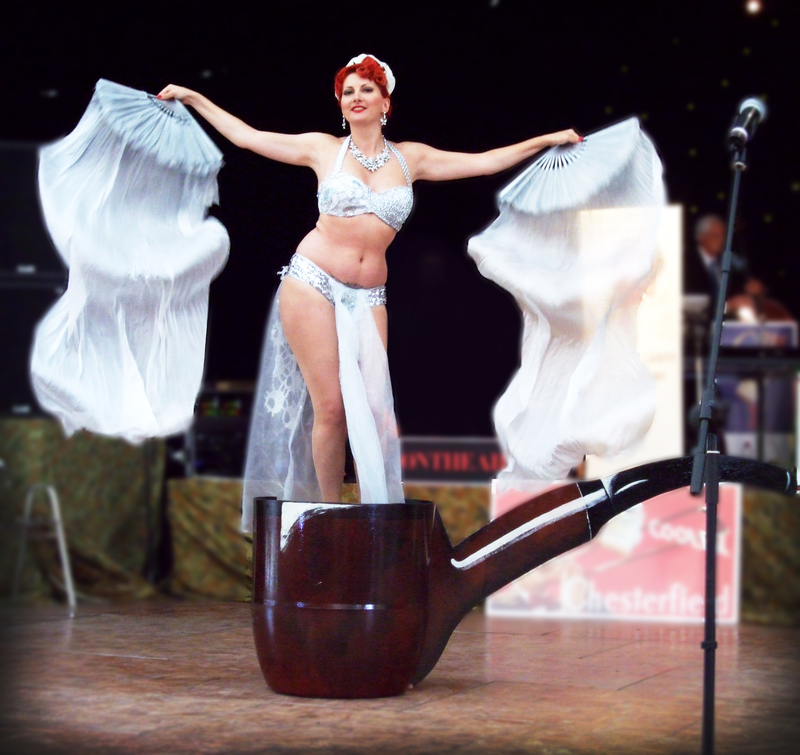 I had decided to do my Pipe Dreams act, which is a gorgeous, sparkly WHITE costume (silly, silly kitten…. ), which would also showcase my new, spangle-tastic silver shoes from Johnson’s Originals (yes…I know…). As I hid beneath my ghillie ‘tobacco’ cloak and staggered towards the entrance of the tent, a rather lively German reenactor didnt realise I was creeping up behind him and gave me a prompt kick on the knee (He was performing an energetic Morecombe and Wise dance move that would have been impressive without the plastic beer glass in hand). As the mud gave me friendly pat on the back of my fishnets and greeted my NEW SHOES with as much enthusiasm, I suddenly realised that the front of my white panel skirt also now resembled a piece of used toilet paper and I hadn’t actually started my performance yet. So what happens in this sort of situation? Do you storm off like a big stroppy Diva? No, you ruddy well get on with the show and laugh it off. Yes there were swear words later and even a disgruntled huff with furrowed brow (I know, stand back when you see these signs), but those are the hazards you have to face when working in these environments. They still enjoyed the show and I fear most of the audience were more ‘moths to my light bulbs’ than my disgraced shoes, but that is all the better. More importantly the shoes are now clean and lovely again! Huzzah! Posted in Day to Day, Events and Performances and tagged 1940's burlesque, 1940's events, 1940s shows, burlesque, johnsons originals, johnsons shoes, kitten von mew, kitty von mew, lola lamor, lola lamour, pinup girl blog, vintage girl, vintage pinup, war and peace show, wartime in the vale, ww2 events, wwii events, wwii shows. Bookmark the permalink. All I can say is BRING YOUR WELLIES (or your ‘Rubbers’ as my American friend Stephanie calls them…hee hee hee!). The fields are water-logged, the dirt will be churned from vehicle movement and foot glamour will be on hold this year! Contrary to most people’s thoughts on the classic green, the first Dunlop Wellington Boots were matte black rubber, so if you have some, bring them for an authentic touch! Why not tuck some trousers into them for a Women’s Land Army Look? Don’t forget to carry some dance shoes in your bag/ wicker basket for some much needed dancing in the main marquee! 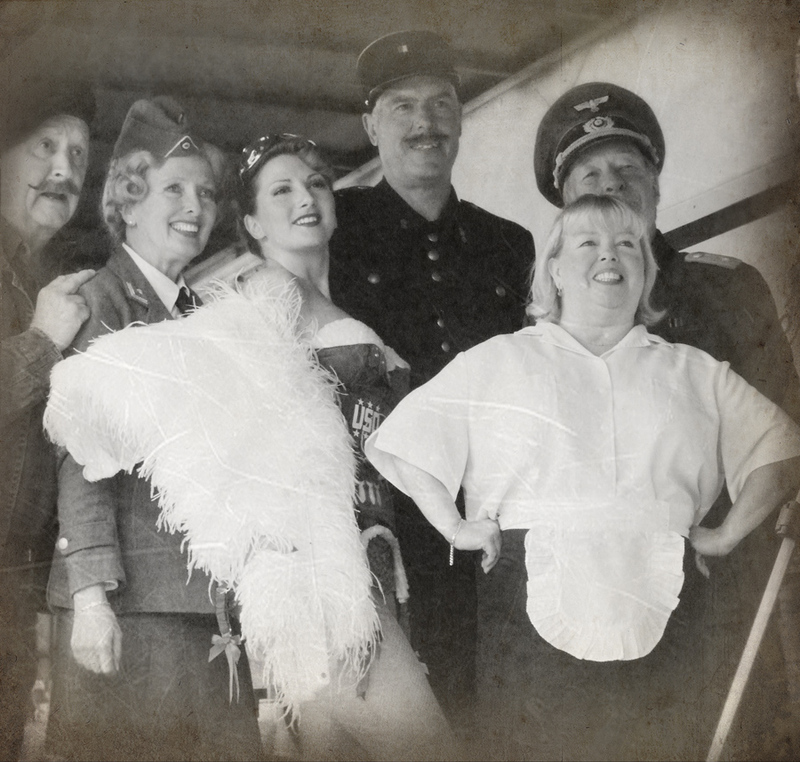 Also, more great news is that some of the original cast from ‘Allo ‘Allo will be doing a skit in the main marquee at around 2pm on a few days of the event! Im mortified that I will be getting changed for my performance at 2.30pm at that point, but so glad they will be back again as they were a hoot last year! Well, I will be there from Wednesday to Sunday, performing every day and some evenings, so I hope you catch a performance. Most of the child friendly performances will be my Boogie Woogie Bugle Boy performance, with an improved costume! This was the first act I ever did with the USO Shows and it will be nice to bring it back again. My new Lili Mewleen act will mostly be used for the adult evening shows, but I will do some family friendly shows too. Posted in Events and Performances and tagged 1940 pinup, 1940's events, 1940s girl, 1940s shows, 2012 event, 40's girl, 40's pinup, allo allo cast, beltring, burlesque, kitten von mew, kitty von meow, kitty von mew, striptease, vintage girl, vintage pinup, war and peace show, ww2 events, ww2 shows, wwii events. Bookmark the permalink.